My reasons for parking in the back of lots have changed over the years, but the end result hasn’t, and that is more steps walked equals more calories burned. Can You Walk 10,000 Steps Per Day? If you have ever been in a walking program or used a pedometer, there is a good chance you were advised to hit the 10,000-steps-per-day mark, but what does that mean? Is it attainable? Let’s break it down into numbers we deal with on a regular basis. The average person’s stride length (the distance between successive points of contact of the same foot) is about 2.5 feet, so one step would be about 16 inches (assuming a normal walking pattern), which means you take about 4,000 steps to walk a mile. So if your goal is 10,000 steps per day, you will walk about 2 miles per day. If you consistently hit that 10,000-step mark, you are considered moderately active. But what about the people who frequently take less than 5,000 steps per day? People in this group are considered sedentary. A drastic increase in steps can lead to many people quitting shortly after starting. People looking to increase their daily steps should look to add about 500 to 1,000 steps per day and increase at this rate every week until they hit their goal. So if you currently take 5,000 steps a day and you are increasing your steps by 1,000 per day per week, it will take you 5 weeks to hit your 10,000-step goal. Parking farther back in parking lots: Parking an additional 20 spaces back equals about 200 steps round trip. Getting up to change the channel: Changing channels 6 times per day equals about 60 steps total. Walking to consult a coworker as opposed to calling them: Based on 2 round-trips of 60 feet equals about 200 steps. Take the stairs: Taking the stairs causes more caloric expenditure than walking on a flat surface, and one flight equals about 15 steps. Walk your pet: Walking around the block equals about 1,000 steps. These are easy ways to add a few hundred steps to your day; pick and choose all, one, or something else. The goal is to go at your pace and to do what you like; anything else will just lead to a decline in program adherence until you ultimately quit. The steps you need are all around you, and if you look hard enough I guarantee you can find the time and energy to take an extra step. Physical activity and exercise are two different terms that have similar concepts. Physical activity such as gardening, walking the dog, mowing the lawn, shopping, and taking the stairs gets your body moving. Exercise is a form of physical activity that is specifically planned, structured, and repetitive, such as strength training, yoga, or aerobics class. Both physical activity and exercise are great for seniors to keep up the daily activities they enjoy. Is Your Physical Activity Decreasing? These phrases are all examples of common physical activity that may decrease in volume with age. Does any of these phrases sound familiar to you or maybe a family member or friend? If so, and you do not feel that you are getting enough physical activity in your life; it is beneficial, if not critical, for you to start an exercise program. Good news! Exercise programs can be modified and designed to fit the needs of everyone, no matter the age, ability, or level, and it is never too late to start. So whether or not your physical activity level has decreased, there is always an exercise program out there for you! More good news! Once you start an exercise program, some of those physical activities that were “too much” before may be worked back into your life! Staying physically active and starting an exercise program can improve your balance, help manage and prevent disease, help reduce feelings of depression and improve overall well-being, and improve your ability to do things you want to do! Do you feel like your amount of physical activity has declined? If so, what have you done to stay active? Maybe it is time to start an exercise program today! 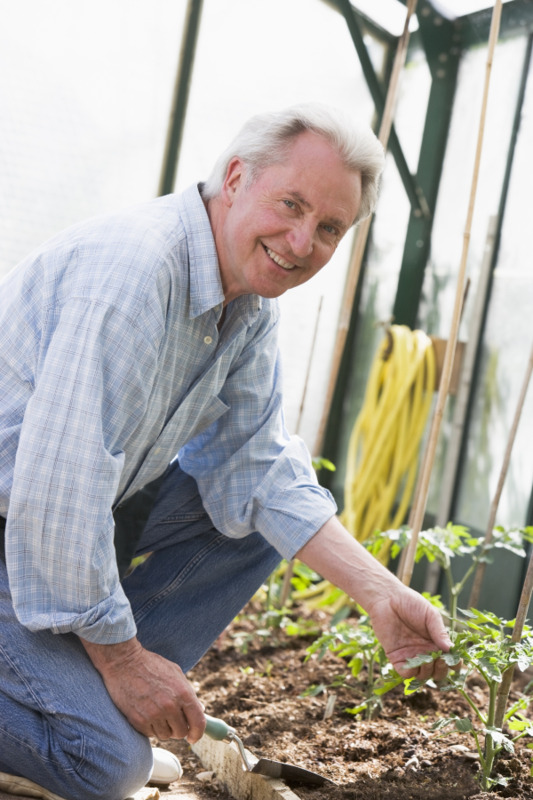 Gardening and lawn work are not only good for cultivating healthy and delicious food and beautiful landscaping, but they are great ways to stay active. Think about all the tools that are used for gardening and yard work: rakes, hoes, wheelbarrows, clippers, shovels, watering cans, and many more. The use of these tools requires the work of all major muscle groups, including your legs, arms, buttocks, stomach, neck, and back. Like any workout, you should always begin with a warm-up. Start with light tasks and work your way up to the heavier, more strenuous activities. For example, start by walking around your lawn or garden, thinking about your plan of action for your project. This will give you a light warm-up, while stimulating your brain at the same time. Remember, make sure you are wearing the appropriate clothing, including a hat and sunscreen. After the warm-up, begin to gather all of your tools from the shed. You can now start digging, setting plants, carrying water, weeding, pruning, and mowing. All of these activities will increase your heart rate and tone your body. Make sure to take frequent water breaks so that you will not become dehydrated. Once you are done with your beautiful masterpiece, don’t forget to cool down. Take a slow walk around your lawn or garden and admire the hard work you have done. There are a few important points to remember before and during your workout. If you are new to gardening or your body is not used to strenuous activities, you may need to break your workout into smaller sessions. When you lift heavy objects, always lift with your legs. If you need assistance with heavy objects, ask for help. If you do not have a large landscaping or gardening area, you can pot flowers or different kinds of herbs and vegetables for your porch or deck. You will still be working your muscles by adding dirt to the pots, digging holes for the plants, and also from the upkeep of weeding and watering the plants regularly. If gardening is not an interest to you and you would like to get exercise outside, try walking around your neighborhood with a group of friends to admire other landscaping and gardens. You could even take a trash bag and clean up your neighborhood. You will be exercising and helping the environment at the same time! There are many ways to stay active, so make being healthy, fun!